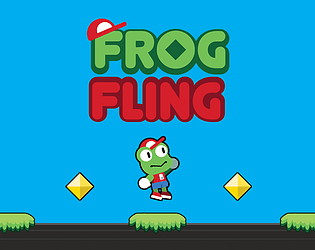 In Frog Fling, every mechanic does more than one thing. When you hold the mouse or A button, you not only fling Froggy in the direction you aim, you can also hold it midair, allowing the player time to plan out their next move, as well as sticking to walls and other objects when next to them to platform throughout the level. The collectibles you grab not only open the door to the next level, but refill the player's hop meter as well. Very Very fun to control! The restarting takes forever though for some reason. We think it has something to do with how many objects are in the layout. Really nice main mechanic, very tight. Got pretty hard quickly though! It kept restarting me on the wrong level, too.